When people get tattoo sleeves, there’s a lot of space to fill in. Sometimes, once your main designs are done, there’s some extra space to fill. This is why some people get ‘sleeve fillers.’ Below, we’ve put together a list of sleeve gap filler ideas. Browse through, and see if any of these fillers could fit your design! Some tattoo designs are related to specific events in your life. Adding a date to your sleeve might personalize your sleeve while filling in empty space. If you don’t want to overcrowd your sleeve, but you want a fuller look, shading with black and grey is an excellent option. Dot work can add texture to your sleeve, while filling in blank space. These can add dimension to your sleeve. These can add organic contours and lively colours to your design. With their black, sharp edges, tribal pattern tattoo fillers can add boldness to your sleeve. 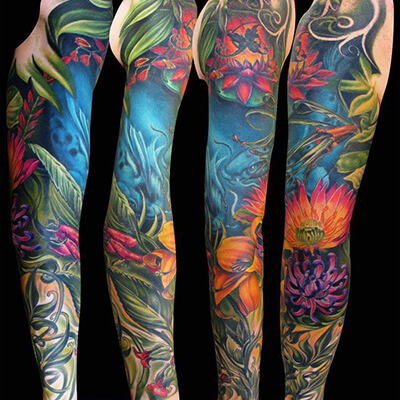 Colour splashes are popular in trash polka tattoo designs. Their expansiveness can add eye-catching colour to your sleeve. These are a popular, aesthetically pleasing design option which makes a great space filler. Due to their cyclical form and flowing shape, waves make a convenient filler. If your tattoo sleeve has some blank space, there are many gap filler options to choose from. Depending on the style and theme of your sleeve, some gap filler designs can really complete your piece. If you know of any other outstanding gap fillers for tattoo sleeves, let us know about them in the comment section below!